MPs have voted to reject leaving the EU without a withdrawal agreement. 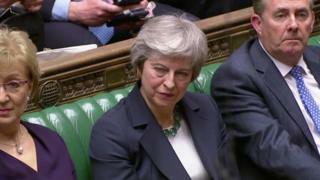 Theresa May said there was a “clear majority” against a no-deal Brexit but the “legal default” was that the UK would leave without a deal on 29 March if no deal is reached. MPs will now get a vote on delaying Brexit, said the prime minister. That vote will take place on Thursday, and if it is passed – and the EU agrees to it – the UK will not leave the EU as planned on 29 March. Mrs May said there could be a short delay to implement a deal agreed in the next few days, or a longer delay if no agreement is reached. The government tabled a motion to prevent the UK from exiting the EU on 29 March without a withdrawal agreement. But before MPs voted on that, they backed an amendment tabled by Labour’s Yvette Cooper rejecting a no-deal Brexit under any circumstances – by just four votes. This dramatic development led to the government ordering Conservative MPs to vote against its own motion. But the government motion, as amended, was passed by 321 votes to 278, reinforcing the message that MPs do not want to leave without a deal. Speaking after the result was read out, Mrs May said “the options before us are the same as they always have been”. “The House has today provided a clear majority against leaving without a a deal, however I will repeat what I said before. “These are about the choices this House faces. The legal default in EU and UK law is that the UK will leave without a deal unless something else is agreed. The onus is now on every one of us in this House to find out what that is. Mrs May had promised Conservative MPs a free vote – meaning they did not have to follow the orders of party managers – but after MPs unexpectedly voted for Yvette Cooper’s amendment they were ordered to vote against the government motion. Some ministers, who are against a no-deal Brexit, abstained on the vote, which would normally mean they would have to quit the government. MPs also voted by 374 to 164 to reject a plan to delay the UK’s departure from the EU until 22 May 2019, so that there can be what its supporters call a “managed no-deal” Brexit. This amendment was proposed by Prime Minister Theresa May’s former second-in-command, Conservative MP Damian Green, and was backed by prominent Conservative Brexiteers and Remainers. It was known as the Malthouse Compromise – after Kit Malthouse, the government minister who devised it. Labour leader Jeremy Corbyn said that Parliament must now take control of the Brexit process and his party will work across the House of Commons to seek a compromise solution.